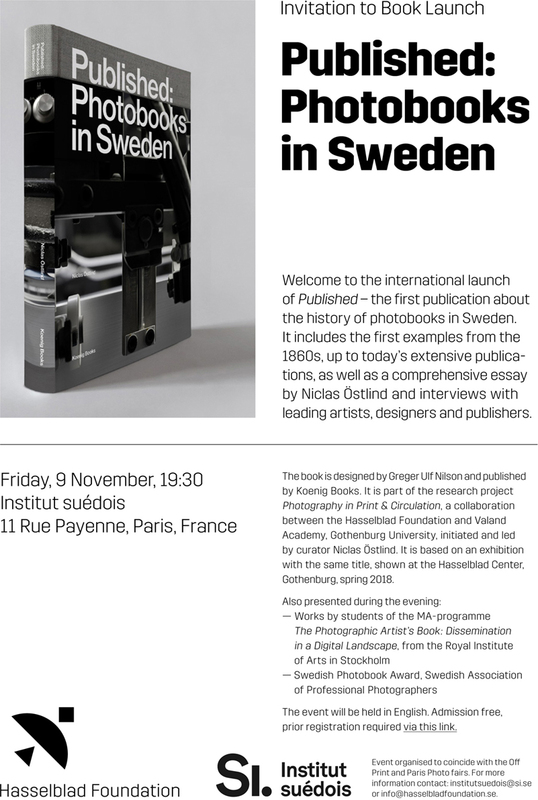 Book launch of PUBLISHED – the first survey of Swedish photobooks at Paris Photo Fair at Institute Suedois, Paris. Author Niclas Östlind. Design: Greger Ulf Nilson. Cover image: Mikael Olsson. Interviews with Anders Petersen, Carl Johan Erikson and Björn Larsson, Bruno Ehrs, Matilda Plöjel, Marie Lundquist, Klara Källström and Thobias Fäldt, Greger Ulf Nilson, Elsa Modin, Mikael Olsson, Helene Boström and Charlotte Ekbom.